Operators who are in the market for a new air drill could make the most of their money by investing in the John Deere 1895 Air Drill. This machine comes with optional air seeder row marketers, blockage warning systems, and an open center hydraulic check valve. Let’s take a look at some of the other highlights and benefits of investing in this air drill. 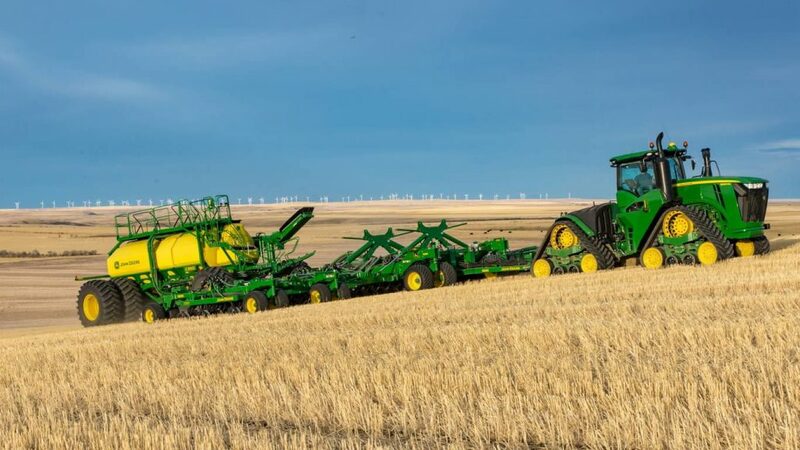 The John Deere 1895 Air Drill is 60 feet wide to provide 40 percent more working width. This results in the seeding of an additional 100+ acres per day. The air drill easily folds up to 19 feet wide and 17 feet high when it needs to be transported. The larger tires provide better flotation out in the field, resulting in less soil compaction. The frame sections of the John Deere 1895 Air Drill flex in order to adapt to hilly terrain. The John Deere 1895 Air Drill offers up to 400 pounds of downforce at the opener, making for more even seeding. This air drill features the TruSet™ system, which gives operators the option to set downforce and monitor it continuously out in the field. The John Deere 1895 Air Drill has Auto Implement Detection. It saves setup time by remembering machine options. Relative Flow™ blockage monitoring allows operators to keep an eye on seeding and fertilizer across the entire drill. With this information, users can spot any problems before full blockage occurs. The Pro Series™ opener helps operators make the most of their seed and fertilizer. The Press wheel is narrow and flexible, improving soil-to-seed contact. The narrow seed boot is tighter to the disk, which helps keep the soil in place. The boot itself also now has a flag pin, rather than a bolt, to keep it from moving. This ultimately improves accuracy and reduces wear. The redesigned seed tab fits better into the furrow and keeps seed from bouncing out. An enhanced closing wheel is specifically designed to better close the trench. Whether you’re in the market for a new air drill or you simply want to improve your efficiency out in the field, the features of the John Deere 1895 Air Drill could help you achieve your goals. Watch the video below to learn even more. If you have any questions on the John Deere 1895 Air Drill or its features, contact your local John Deere dealer.